CASEY'S SLIP Giveaway Contest on GoodReads in September! 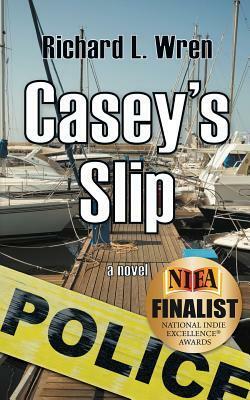 For the month of September, enter a giveaway contest for a copy of my first novel, CASEY'S SLIP. A dozen entries will be randomly selected by the folks at GoodReads.com to receive a free copy of the novel. Click the book cover below to be taken to the giveaway entry page. If you are not a member of GoodReads, join for free! Giveaway ends September 30, 2015. See the giveaway details at Goodreads. Sign Up for My Newsletter and Announcements! The basic idea is to trick your mind so that you don’t get caught up in the story and miss the mistakes. Surround yourself with WOE IS I by Patricia T. O'Connor and a good dictionary. Inflate size of print on computer page so that you see as few lines as possible. You will be able to almost edit word by word. Print text. Using a piece of cardboard, cover whole page except first line. Edit page, one line at a time. Edit backward. Starting at “The End” instead of the beginning, one paragraph at a time. Have Create Space print a few proof books (free) and have your severest critic read and edit them. Find retired teachers who might edit them for free just for the hell of it. Read book OUT LOUD to an audience. What do you think? Have anything to add? Each year, millions of people – young and older -- look at themselves and their jobs and careers and wonder whether they should start something new. This may be especially true of people who are retired, who also may wonder if it’s not too late to do so. One individual in his 80s decided it wasn’t (too late) and reinvented himself. After a fulfilling career in the insurance industry and numerous retirement activities, Oakland resident Richard Wren decided to live another dream while in his early 80s: becoming a published novelist and an inventor. His first effort, the mystery novel CASEY’S SLIP, was published in 2011 and took him three years to produce, during which he started his own publishing company. What he learned along the path to the first book allowed him to finish his second, JOSHUA’S REVENGE, in a matter of months and have it published in mid-2012, while working on the third. That third book, a sequel to Joshua’s Revenge entitled Justice for Joshua, came out in his 88th year (2014), soon after he moved to Lafayette, CA. CASEY’S SLIP received national recognition from the 2014 National Indie Excellence Awards, taking second place in the Action/Adventure category, and receiving a Finalist Award. At a spry and energetic 89, he’s currently working on a sequel to Casey’s Slip, and is working with a screenwriter to market a screenplay based on that first novel. In the midst of fiction writing, he decided to share what he learned with other budding novelists, a common-sense approach to finishing and publishing a novel, and publish that as a booklet and ebook. A Practical Guide to Writing & Publishing a Novel: The Keep It Simple and Successful (K.I.S.S.) Way truly is a powerhouse – short and succinct, common sense advice, resources and action points all packed in less than 30 pages. Unlike the majority of other “how to write a novel” books which often focus on plot, character and dialog, it’s about getting the writing done, getting past any hold-ups and blocks, and getting it into book form. Most would-be novelists have a story to tell, but often don’t know how to get it together enough to actually write, let alone publish, the novel. But it’s also relevant for non-fiction writers, and a non-fiction specific version will be out soon. Wren has truly reinvented himself, and his excitement for his new career as an author shows in the enthusiasm he presents while discussing his books, what he learned in publishing them, and even in his desire to spread the word about his works. He is active in promoting his work and his simple plan for publishing. But he’s not merely satisfied with doing just the one thing (writing): he’s also an inventor, and having lots of fun with that as well. Richard Wren has much to say to people considering taking on something new, especially to our growing senior population. Using one’s mind is the best way to defeat the telling affects of inactivity, and writing is one of the easiest ways to do that. Reinventing oneself as a writer, whether writing fiction or nonfiction, is an easy path for seniors with decades of life experience. Too many have let the obstacle of getting published stand in their way. Richard L. Wren’s books are available from Amazon.com and BarnesandNoble.com, both in print and as Kindle ebooks, and also available in bookstores throughout the US. He is available for interviews about how he reinvented himself (and advice for others), about getting a book done and published, and about his novels.